Two men jumped out of a van and tried to steal a pug from its owner in the Borders. 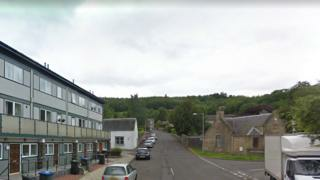 The incident happened at about 19:45 on Friday in Elm Row in Galashiels. A 24-year-old man was out walking his dog when the two would-be thieves got out of a white Transit van and tried to take the pet. Police said a struggle then ensued and the men were disturbed by a passing driver. They then got back into their vehicle and drove off. The suspects have only been described as being white with stocky builds. Police are keen to speak to the occupants of a Peugeot 206 who disturbed the men. Det Sgt Callum Peoples said: "At this time, we are working to establish the full circumstances of this incident and would urge anyone who believes they have any relevant information to come forward. "Similarly, if you were on Elm Row during Friday evening and witnessed what happened, or can help us identify the men responsible then please also contact police immediately. "In particular, we are keen to speak to the driver, and any other occupants of the Peugeot 206, which passed this incident, but didn't stop." What is it like to find 'treasure'?